Manchester United's defence of the Premier Section at this year's Milk Cup will include a game at the Brandywell as the competition visits the Derry stadium for this first time. United face CSKA Moscow at Derry City's home ground on Wednesday 30 June. Earlier in the day, China's Elite Section game against Canada will also take place at the venue. The Junior Section game between Rangers and Liverpool will be played at the Ballymena Showgrounds on 29 July. 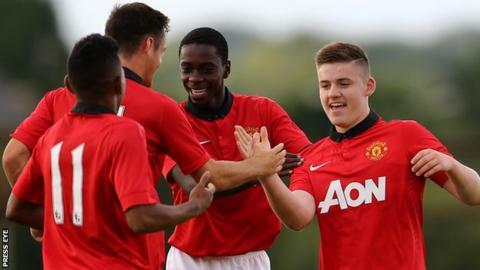 Manchester United commence the defence of their Premier title against the Gold Coast Academy from Australia at Coleraine Showgrounds on Monday, 28 July. This will be followed on Tuesday by their game against Co Armagh at Riada Stadium in Ballymoney. In the Junior Section holders, Everton will play Middlesbrough on Monday at Castlerock, Brazilian side, Corinthians at Anderson Park on Tuesday and finish their qualifying games against Co Fermanagh on Wednesday at Ballymena Showgrounds. The competition will begin with the traditional parade of competing teams through Coleraine on Sunday, 27 July, concluding with finals night at Ballymena Showgrounds on Friday, 1 August.